﻿ How to get the most out of Google Docs? Tips and tricks. Over the past few weeks, we have presented different solutions on how to use a word processor, spreadsheet, presentation editor, forms and drawings in Google Docs. After discussing all the included modules, we have taken an extended look under the hood of Google Docs and uncovered several tricks for getting the most out of Google Docs. If you haven’t looked at Google Docs recently, now’s a good time to check it out. In one of our articles, we mentioned the possibility to export files from your Google Drive to your hard disk. This is especially useful if you want to send a file to a friend who prefers the traditional Office suite. Not everyone knows that Google allows you to quickly back up all your documents offline. 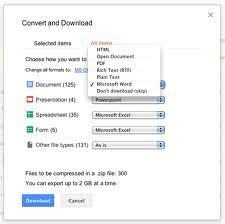 All you need to do is hover the mouse over any file in the Google Docs, then choose Actions and select Download from a drop-down menu. Next, the dialog box appears, and you should go to the All Items tab. The service displays many items organized according to their file type (documents, spreadsheets, presentations) that you can download. The files will be downloaded together in a .zip file. For each file we can choose the target storage format (such as PDF, RTF, DOCX, ODF). The maximum amount of data that can be exported at a time is 2 GB. The handy package that you have downloaded is stored on the HDD. This function is particularly useful when it comes to creating local backups. As a rule, to upload files to Google Drive use the Submit button (it is the one with an arrow next to the Create button). However, despite being cloud-based, we can still drag and drop between our hard drive and Google Docs account. Once we placed our data on the disk, we can get lost in the mix. Fortunately, the application allows us to create folders (also using the Create button), which makes it easy to organize files. Another worth mentioning thing is the inclusion of the search engine situated at the top edge of the interface. Interestingly, just like a standard Google search, this feature also supports operators. These include OR (meaning "or" - exam OR exam), - ( which means that it excludes the word – test -math) and type: (searches for files of a specific type, we write a type after the colon). Plus, there are date operators (before: YYYY-MM-DD, after: YYYY-MM-DD) which show the documents from the certain periods or the owner: searches for files depending on the owners (useful if you do not remember the title, but you know who shared the document with you. Click here for a complete list of operators. You can also search your Google Docs from within Gmail, by selecting the ‘Settings’ icon. Then click the Labs tab and turn on ‘Apps Search’ option. Google Drive also lets you create, upload and virtually store all types of files. 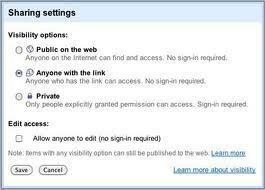 Due to the extension Send to Google Docs we can save web pages in the application. The files are saved in PDF format. This Google Chrome extension comes in handy when you want to save an article posted online for future reading. Few people know that there is no need to have a Google Account in order to view the documents. The most important option is placed in the Share panel of each document. Find Who has access, and click Change. Next, select Anyone with the link or the Public. The following message will appear Access: Anyone (no need to log in). Then we can establish a scope of the authority such as viewing, commenting, editing. The final step involves sending out a link to the document to the right people (Google Drive will not send them automatic email notifications). The application also allows users to share the entire directories, not just individual files. To do this, select the folder in the Google Drive’s interface, click the Share icon (a profile with a plus) and continue the procedure as in the case of each document. If you find HTML or Website editing software a little confusing, you can instead use Google’s word processor to edit Web pages. In this case, you do not even need any knowledge concerning HTML code. To create a page, open a new document, add text, insert pictures by clicking and dragging them onto the browser window as well as other items when needed. Once you’ve created a Web page, select File, then Download As, and then HTML ( html, ZIP archive) to download the data. The resulting folder will appear on HDD and will include a single HTML file along with a package of graphics. All you need to do is rename the HTML file as index.html, and upload that whole folder to server. In addition, Google Docs also offers an interesting feature that lets you easily navigate within large files. They are so called tabs. We can find them in the Insert menu. You will see a blue icon, next to the verse in which the cursor is currently located. The last step involves inserting a link elsewhere in the text. Google Drive and Google Docs, like many other Mountain View applications, allows you to use multiple Google Accounts at once. Click on your Google user icon, with the drop-down arrow in the upper-right corner, and then click “Add account” from the drop-down box that appears. Sign into as many accounts as you’d like. Once you’ve done that, your email link in the top left appears as a menu, and you can quickly switch between accounts, or keep multiple accounts signed in on different tabs at once. Managing business account along with a personal Gmail at the same time has never been easier. In addition to the above-mentioned possibility of managing simultaneous accounts, we discovered another amazing feature that integrates both services. It is all about previewing documents using Google mail. To re-enable it, go to Gmail Labs and find Google Docs Preview. It supports text documents, spreadsheets as well as presentations. Previews are displayed inside an e-mail messages which contain relevant links. There is enough information for today. Next week we are going to invite you for the last part of the series, which will be devoted to the best browser-extensions for Google Drive, Google Docs and mobile applications.